Guys! I'm back and in one piece and so, I want to pass on a few pollinations on my radar. 1. A Little On My New Job to Those Who Asked : First off, thank you for all the well wishes on my new job!!! Yes indeed, I have officially kick started a remarkably exciting career at D-R. Their EMAP program, or Engineering Management Acceleration Program if one were to spell it out, is a 5-year rotational assignment where candidates will take up different engineering positions within the same company at different locations in the U.S and abroad [France, Brazil etc]. If you're a young engineer and single, and you don't mind all the traveling, this is like Blue mentioned, PRO. You learn all the skills and disciplines within the company, do assignments at different locations, meet tons of people and have lots of fun. For the first year, I'm with the auxiliary and control systems engineering group (what they call 'Package' Engineering) so it should be quite an experience. 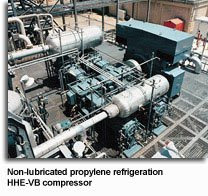 high gas prices means every compressor design has to be more efficient than before. Our machines run 24 hours a day for 30-40 years at our client's sites without disruption in service and thats hard to imagine. The last thing they want to hear is downtime. For most of those refineries, shutting down for a day means a loss of close to half a million dollars in revenue. This is a real learning experience for me and the people here are amazing, so yes I'm very thrilled. 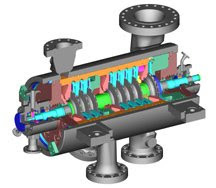 Turbo machinery is a highly exciting and specialized field to get into which is what I want to do. And I really hope as time evolves that I can check out a client's site like an offshore oil rig....coool! 2. Here are the only casualties of the moving. The movers dropped my stuff off at the apartment in Olean and left. Later on when I got there from Buffalo, here's what I spotted quickly with my 20/20 vision. A piece of the aluminum alloy flange broke off, leaving 3 spokes to dangle from the rim. This was my Bontrager Race X-Lite tubulars. It left me stumped. Okay, granted these wheels are not the best design out there, this coming from a past post of mine. But how could a piece just break off like that? Surely something must have happened during the turbid trip in the truck. Dear Cook Moving Systems, you did a great job with most of my things but expertly managed to break the very item dear to me. So I'm out to claim every dollar for this mess. Thanks. Here's a link James passed out at Bicycle Design. It talks about the decade long design and engineering behind the Wilson line of downhill bikes from Cycles Devinci. This is a Canadian company. 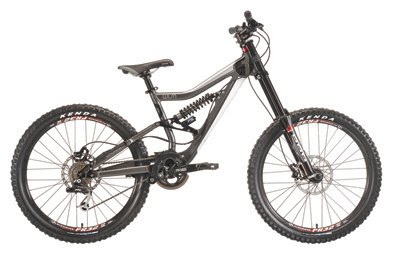 Researchers had built an instrumented bike to aid in the development process and among some of the interesting things they found was the fact that some of the shock forces experienced by the rear triangle of a typical mountain bike frame is enough to lift a small car! Though they are only momentary shocks, the magnitude is still something. So this is a great little read, especially for me as I know little about downhill bikes in general. 4. Here's an interesting question - What do you do if you want to measure the drag effects of bike and positioning in a 9 man TTT? Obviously its not feasible to pay for the ridiculous uptime at the wind tunnel testing facility. .... The results of the simulations were illuminating. Compared with the lead cyclist, the drag of the rider in second place is reduced by 21% - a significant saving. The third rider feels a further small decrease in drag over the second, but from the third rider back all other cyclists experience almost identical drag. As the riders are continually progressing towards the front of the chain, taking a short turn on the front, before freewheeling to the rear of the line, on average (assuming a constant rate of rider rotation and ignoring the effect of dropping back) the drag coefficient of a rider in the TTT is around 27% lower than experienced by an individual rider. Perhaps the most surprising conclusion from the CFD simulation is that, despite feeling the full force of the oncoming air, the lead rider experiences lower drag than if he were riding an ITT at the same speed. The drag coefficient of the leading TTT rider is 0.277, while that of an individual rider is 0.285 [drag coeffient is measure of the force each rider experiences corrected for differences in size]." Very illuminating indeed. Read the entire case study here on this site. 5. And in upcoming sports, I think 'wave biking' is just beating the heck out of bike polo. This intelligent person might make it to the other shore some day. "Rider's log, June 29, 2030...I rode my bike .5 inches into the water today...Will try tomorrow. End." I recently completed a set of tests to see if there was a difference in lubricants. The lubricants tested included lubricants directly marketed to the cycling market (e.g., Pedros or Pro Link) as well as general household products (WD-40, 3-in-1). A leap of faith is taken in terms of this testing in that it is assumed that the materials sliding against each other don’t matter to the degree as the lubricant. A 440C ball was slid against an Inconel sample (an exotic nickel alloy based steel) on a pin-on-disk tribometer. Dry sliding tests were performed to establish a baseline (dry friction above 0.60). A wear track was developed, and this wear track was used for all tests rather than starting a new track. This was done to keep the effect of roughness in the testing. After a lubricated test, the Inconel sample was cleaned and stripped of the lubricant. A dry run-in test was performed to verify the cleaned sample was free of lubricant and that the dry sliding friction was at least the initial dry value (i.e., over 0.60). Contact force was set at 5 N. Tests were run wet, immediately after application of the lubricant (later tests will including wiping off excess and allowing lube to "dry"). Below are the results when the lubes were performing their best. Some started to break down significantly. Which performed the best? 3-in-1, a heavier household oil (would attract dirt), was darn good, but the one that took the prize was, of all things, WD-40. Pro-Link rated 3rd in my tests, with the others jumping up in friction near the conclusion of the tests. Should be noted that the expected range below is simply 3-sigma min/max values. I doubt the first 2 on the list would go as low as written. Just the large deviation (in other words, poor stability) brings the values down that low. This is an interesting thread so you can follow it all here, including the results of his testing. I wonder how repeatable these results are but I do have to add - wow, is WD-40 making a comeback as bike lube? Because I said so .....? Your new job sounds great. Enjoy the novelty of it all. You should be able to file a claim with the mover for damage. However, I can't conceive how the could possible break a hub like that. Guys are wave riding on fixed gear mountian bikes and having much better rides than that guy. Why they do it? Because they can. Hey Ron, the new job sounds great; definitely a good opportunity to learn. Interesting break on the hub flange. Were they in a box or just tagged and stiffed in the truck? Thank you all. Yeah the job is really great. No, the wheels were not boxed. I had a bunch of wheels together and this was the only one that had damage. It beats me how it could have happened, but I think they must have taken a nice fall either in the truck or while handling. The claim papers are getting mailed to me. I don't have a clue as to how they work - by weight or whatever, but there is a figure of 10,000 dollars on the receipt they handed me so let's see. Best of luck on the new job. I am jealous. I am also an engineer and it sounds quite cool. Thats a bummer about your wheel.